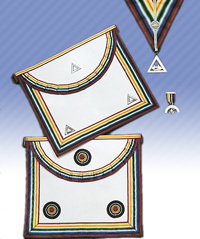 The Royal Ark Mariner regalia comprises an apron of white kid having a segmented flap, all bordered with raibow ribbon one inch-and-a-quarter in width and having three rosettes of similar ribbon. The apron of a Commander is identical,save that the rosettes are replaced by triangles of silver. This degree, although worked under the aegis of the Grand Lodge of Mark Master Masons, and requiring every candidate to be a Mark Master Mason, has no historical connection whatsoever with that degree. Mark Grand Lodge's rule over the 'Ancient and Honourable Fraternity of Royal Ark Mariners' is simply a quirk of fate and a very interesting story in itself (but one that must be left until after you have joined our ranks!). As it name suggests, it has a nautical flavour and takes, for its scenario, the circumstances leading up to the Great Flood as recorded in the Book of Genesis and the steps taken by Noah to build the Ark by which mankind was preserved from perishing in the 'Universal Deluge'. Like the Mark Master Mason's Degree, which is based on an established fact (i.e. the construction of the Temple at Jerusalem), so the degree of Royal Ark Mariner is also based on an actual happening, i.e. the Great Flood, as recorded in the Bible and as verified in the year 1929 by archaeologist Sir Leonard Woolley, who not only found clear evidence of the flood, and established that it had occurred some 6000 years previously, but also proved that it had covered an area of some 4000 square miles of what was then Mesopotamia, now Iraq. To the people of that part of the world, who probably never travelled beyond the perimeter of their own villages, it must have seemed that the whole world was under water. Quite recently, there have been developments in that part of the world inasmuch as an expedition, looking for evidence of the Ark on the Turkish-Iranian border and using aerial photographs and radar imagery, believe they have found the remains of the Ark, 75 feet below ground level on the upper slopes of Mount Al Judi, at an altitude of some 7000 feet. The image appears to be about 515 feet in length (comparing favourably with the 300 cubits specified in Genesis). It is worth reflecting that one translation of the Bible says that the Ark came to rest in the mountains of Ararat rather than Mount Ararat and also that the Qur'an, the holy book of Islam, has its 'Noah' character and that, in the Qur'an account of the flood, the Ark comes to rest on Mount Al Judi, which is part of the Ararat Mountain range and a mere 20 miles from Mount Ararat ! There's certainly food for thought there, and, who knows, we may be on the threshold of a most remarkable discovery. Unfortunately, since the preliminary work was completed, there has been a civil war in the area and so all further expeditions have ground to a halt. Even more recently, a CIA Satellite detected a shadow on Mount Ararat which could turn out to be remains of the Ark and the reason it has not been seen before is that apparently only on exceptional years does the snow line recede sufficiently for the image to be viewed. It also appears that, during the first world war a Russian airman photographed what he said were the remains of a large ship in exactly the same area; unfortunately Czar Nicholas II, who had determined to mount an expedition to the site, was assassinated soon afterwards and the communists destroyed the photographs. We will, sooner or later, learn exactly what lies on the slopes of Mount Al Judi and Mount Ararat and, who knows, the legend may be brought to a firm conclusion. Getting back to the Masonic side, the senior officers of a Royal Ark Mariner Lodge represent Noah and two of his sons, Japeth and Shem. During the ceremony, analogies are drawn between the dangers of the flood and the dangers of life, and how we should strive to reach the 'Ark', the haven of rest, just as Noah's family and the other occupants of his Ark did, according to the account in the Bible. In this degree there are some really beautiful portions of ritual which are guaranteed to make a lasting impression on every candidate.